City University London has a history of naming buildings to recognise the contributions made by former Vice-Chancellors and eminent staff. 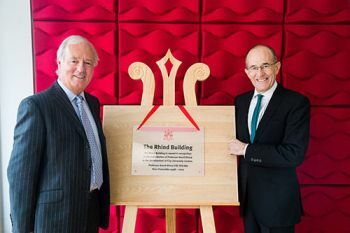 In keeping with this tradition, the University has opened the Franklin Building and named the Rhind Building in honour of former Vice-Chancellors Professor Raoul Franklin and Professor David Rhind. Professor Franklin was appointed City's t hird Vice-Chancellor in 1978 and held the post until 1998. He is the University's longest serving Vice-Chancellor and also held the position of Professor of Plasma Physics and Technology from 1986 to 1998. While at City, he was successful in raising additional income for the University through his collaboration with business and industry and rapidly expanded City's professionally-oriented postgraduate programmes with the mantra 'City makes other universities' graduates employable'. His work led to City winning four Queen's Awards for Enterprise, two for technology and two for export. Professor Franklin also co-founded what was to become The Worshipful Company of Educators. Some of the Company's members including its Master, Mr Peter Williams, attended the opening ceremony. Professor Franklin was made CBE in 1995 for services to higher education. 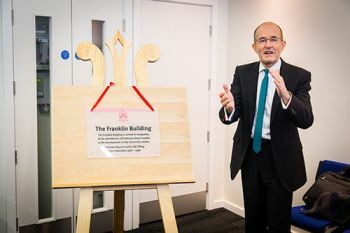 The Franklin building in Goswell Road, named in his honour, houses the University's new sports centre CitySport, the largest student sports facility in central London, new educational space and student bedrooms available through our accommodation partners. Professor Rhind succeeded Professor Franklin as Vice-Chancellor in 1998 and held the position until July 2007. He did much to shape the University that we see today: in particular he improved the crumbling estate, strengthened research and launched the Cass Business School. Previously he was Director General of the Ordnance Survey where he oversaw the transformational digitisation of its maps. In 2002 Professor Rhind was the first geographer elected to the Royal Society for nearly 50 years and holds the distinction of also being a Fellow of the British Academy. In 2011, City awarded him an honorary Doctor of Science and he was made CBE. The Rhind Building, named in his honour, is located opposite College Building and was completed during Professor Rhind's tenure as Vice-Chancellor. Previously known as the Social Sciences Building, It houses parts of the City Law School and the School of Art & Social Sciences. Speaking before unveiling the plaque, Professor Rhind said: "Having been involved from beginning to end in the creation of this superb, functional yet beautiful modern building, in which much top class education and research has taken place, I am deeply honoured by the University's decision to name it the Rhind building." Professor Paul Curran, Vice-Chancellor, thanked Professor Franklin and Professor Rhind for their years of leadership. "Professor Franklin and Professor Rhind are very important figures in City's history and it is a pleasure to name the buildings in their honour. They will forever be remembered for their services to higher education and the roles they played in shaping City University London as an institution." City has previously named buildings in honour of Professor Sir James Sharp Tait and Professor Sir Edward Parkes, its first and second Vice-Chancellors. The University also has a building named after Dr Charles Vickery Drysdale, former Head of the Applied Physics and Electrical Engineering Department and one of the Northampton Institute's first lecturers. His contributions to optics saw him elected as President of the Optical Society; his development of sonar depth sounding saw him appointed as Scientific Director for the Admiralty; his publications on the link between population control and world peace saw him appointed as President of the globally influential neo-Malthusian conferences of the 1920s; and he was the founder of the Family Planning Association.